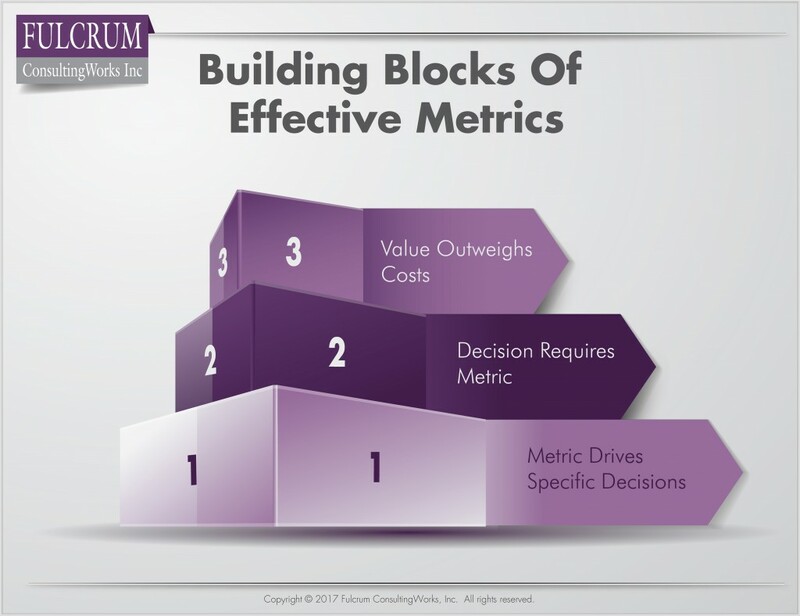 Three Measures of Effective Metrics | Fulcrum ConsultingWorks Inc.
Lastly, we often track metrics that do not provide clear interpretation. If in discussing a metric you find yourself saying “but product mix impacts that” or “well, it depends,” your metric is not well-defined. Here are three ways to measure the effectiveness of your metrics, and ensure the ones you end up with help you run your business better. You can list one or more decision that you will make, based on the value or direction of the metric. If you can’t do that, the metric is interesting but irrelevant. If a metric is so important that you won’t make a specific decision without reviewing it first, it’s probably a good one. The value of improved decision-making because of the information outweighs the costs of reporting the metric. If you want to run your company “by the numbers,” make sure ‘the numbers’ help you run your business better. If you realize that good processes drive good results, ensure your KPIs assess processes, not people. Assess your current KPIs using the three measures I just provided. Eliminate, modify, or retain so your KPIs are key to the quality of your decision-making.